The Victoria Building Survey (by the Alberta Historical Preservation and Rebuilding Society) indicates it was completed in 1910 as a rooming house. But the fire insurance maps indicate that the front portion of the building may have been built as a single-famly house by Sept. 1908, and that the rear portion of the building, the apartment section, was added sometime after October 1911, probably around 1912. The first occupant of the building was also its owner, Thomas George, a building contractor. Which suggests he built the rooming house for himself as a rental property, which may be an indicator of underlying quality. After 1928 the owners were Mr. and Mrs. Seneca E. Steele. Mr. Steele was a long-time yardman for the CPR. (A recent Herald story suggested that the rooming house once housed many CPR workers). Anyway, this needs some more research to sort out the contraditions. The front of the building is brick but was stuccoed over sometime between 1971 and 1985. The current ‘peaked’ portico was also added at this time. A 1971 photo shows an unstuccoed front, and a more modern-style rectilinear portico above the door (which could have been added anytime between the 20s and the 50s most likely). Last edited by newsposter on Thu Jul 10, 2008 5:37 pm, edited 5 times in total. years ago and are still considered assets in the community. renovation, to the satisfaction of the Heritage Planner. designated buildings under the Beltline ARP. to finding a new and productive use for Hamilton Terrace. 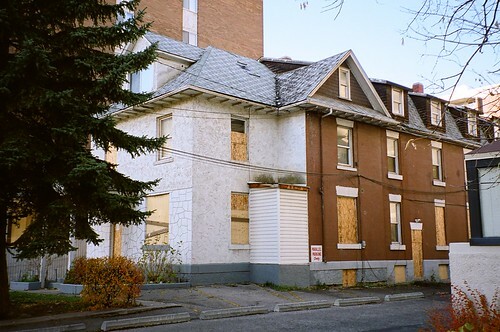 On August 24, 2006 Calgary Planning Commission approved the conversion of the Hamilton Terrace rooming house to office uses. See above for more information. On October 16, the proposal will go to City Council. In the meantime, the building was recently declared unfit for human habitation. 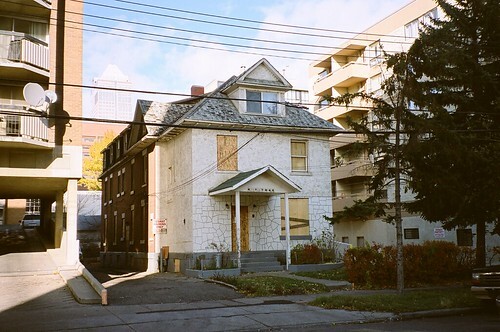 More news of "Hamilton Terrace", a 'notorious' pre-WW1 rooming house in the Beltline being converted to offices. See ^ for more. The house in the 300 block of 14th Avenue S.W., known to some as the Shooting Gallery or the White House, was declared unfit to live in by the Calgary Health Region last September because of mould and other problems. Keryo said he is happy to pay the fine and move on. The company's guilty plea will bring an end to the building's 67-year run as a rooming house, he added. It's being converted into office space. More on planned office conversion of the old Hamilton Terrace rooming house in the Beltline (most recently a notorious "crack house"). Just goes to show that even badly abused historic buildings can bounce back and find new uses. Good luck to the new owner! See above for more including photos. Hamilton Terrace, still boarded up, is up for sale. We believe it is the same owner as the Cowsill House (see elsewhere on the website), another boarded-up historic building which is also for sale. Is the properties are still exists or sold?